L.M. Reid is an Irish writer who has published many articles. 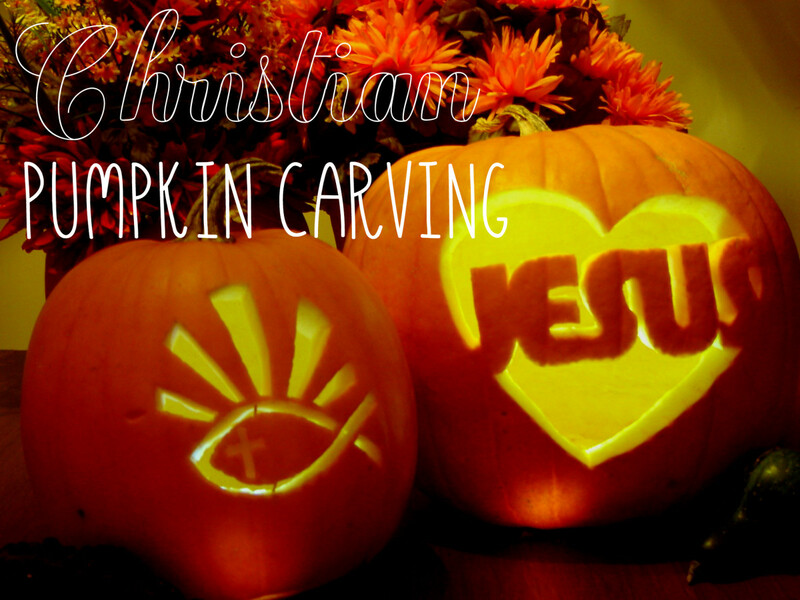 She makes prize-winning Halloween decorations and shows you how here. I make all my own outdoor creepy Halloween decorations every year. 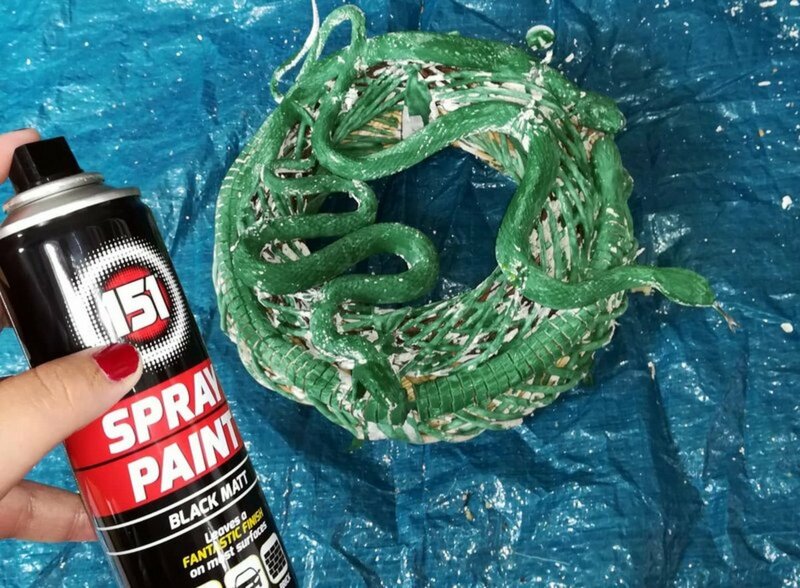 This is how I made a wreath covered in snakes. It really looks very scary. 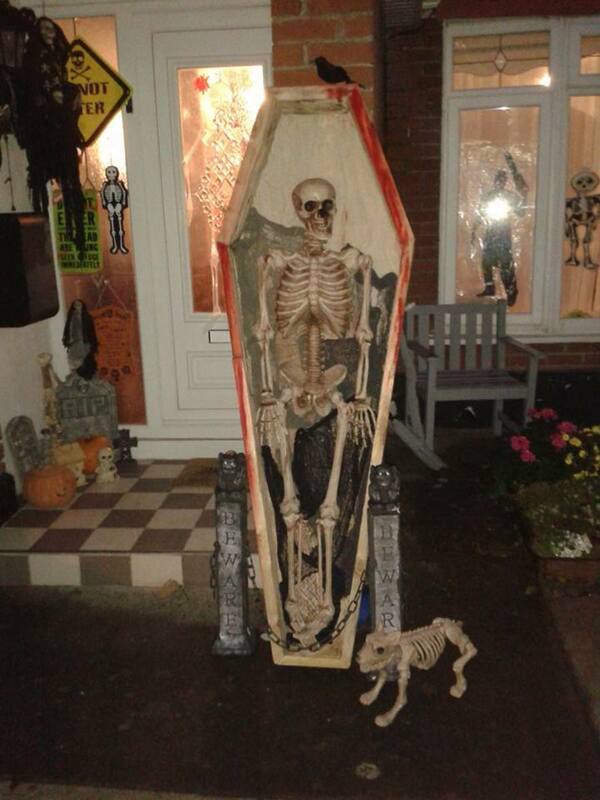 It is going to be attached to the door so the kids will have to get up close to knock for their trick or treat. Here is a step-by-step guide with lots of photos so that you can make one yourself for the holidays. 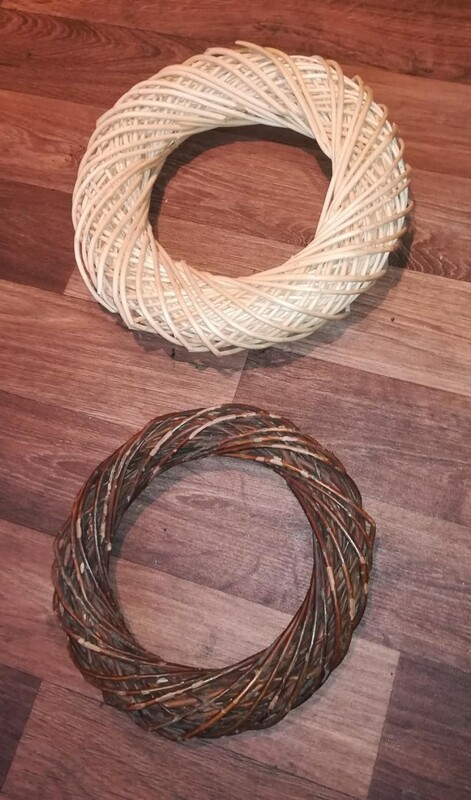 Wreaths - 1 large and 1 small. 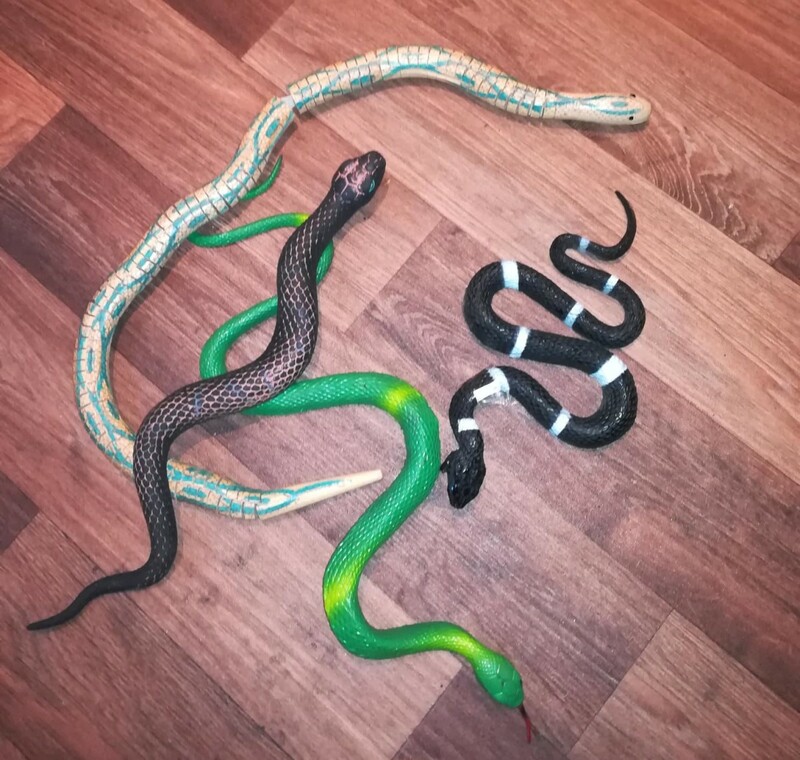 Snakes - I used 4 but you can add more if required. A few lengths of string or ribbon. Paint to use as an undercoat. Place the smaller wreath inside the larger one and tie securely together with some string or ribbons. Arrange the snakes around the wreath until you have a display that you like. 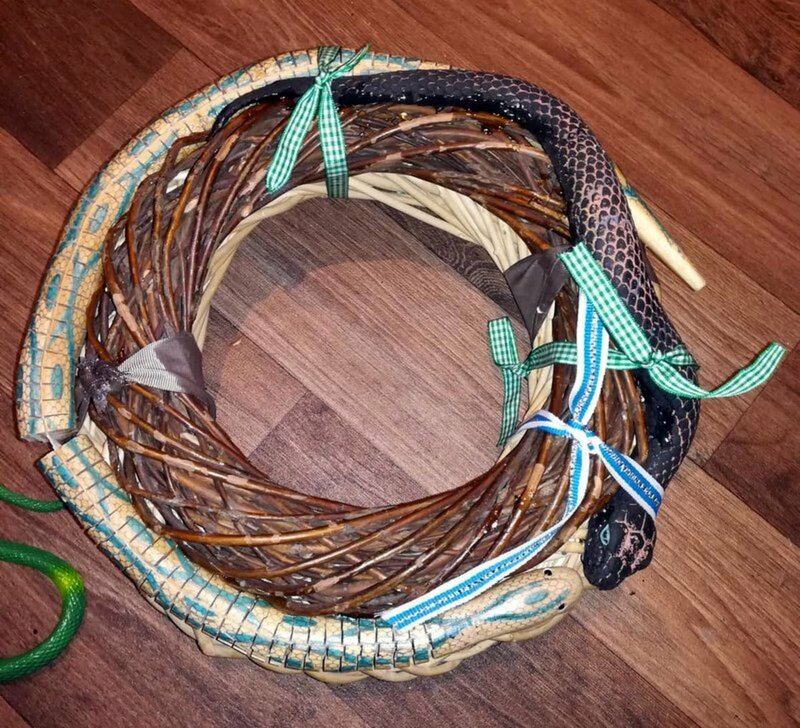 Take the largest snake and using some glue attach it to the circle. Tie some string or ribbon around it too so it remains secure. 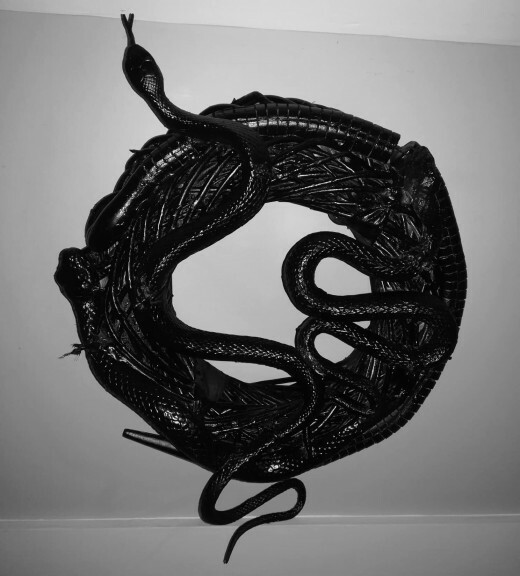 The snake will look better if you can wrap it around the edges with the head falling away from the main part. Do the same with the remaining snakes. Paint the wreath all one colour as an undercoat. Allow the paint to completely dry overnight. Put on some rubber gloves to protect your hands. 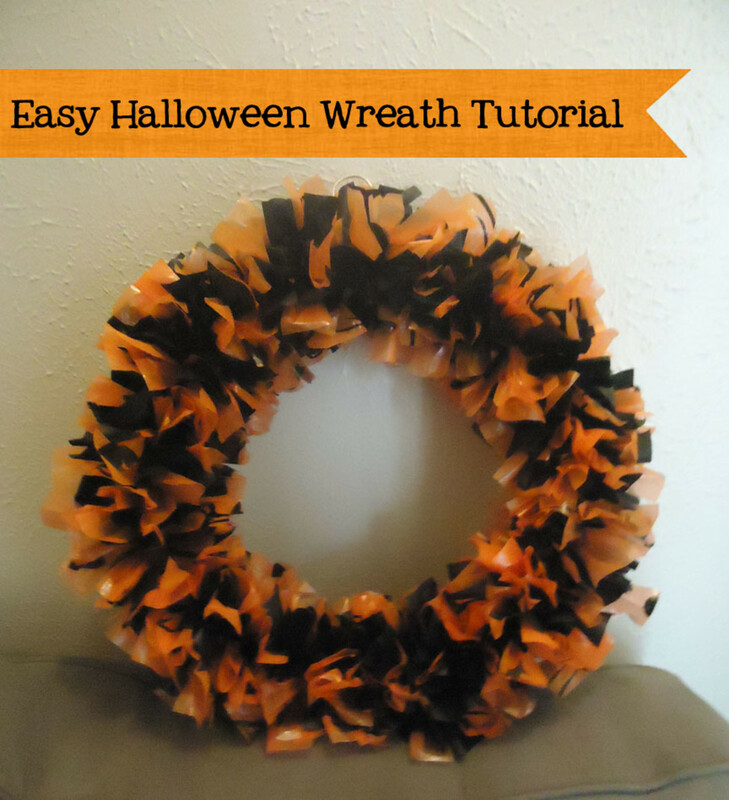 Place the wreath on to a plastic sheet and spray paint it black. For a better 3D look leave some of the undercoat visible on the scales of the snakes. Do the same again on the other side. Give it a second coat if you think it is needed. Spray paint with clear gloss varnish on both sides. This protects it from the bad weather. Wreaths come with hoops of wire on the back to hang it on the door. Screw a hook on your door where you want to place it. 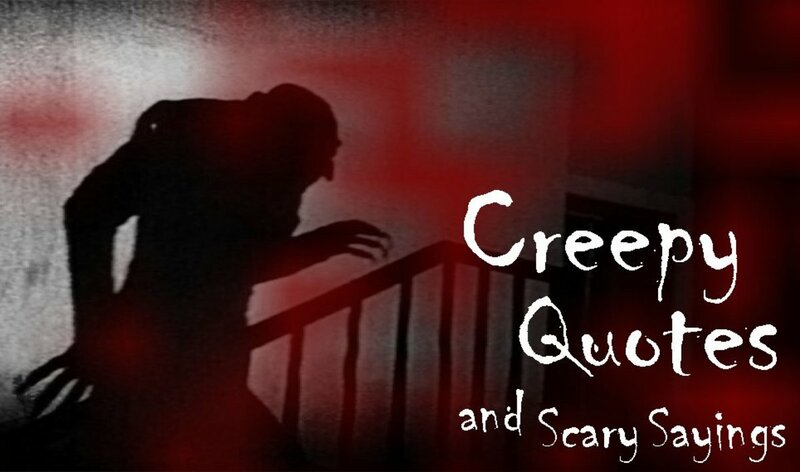 Mine is going to be right next to the doorbell for the desired creepy effect. Attach the wreath onto the screw and then use a pliers to bend over the screw opening until it closes. This will make it secure and prevent anyone taking it away from your door. 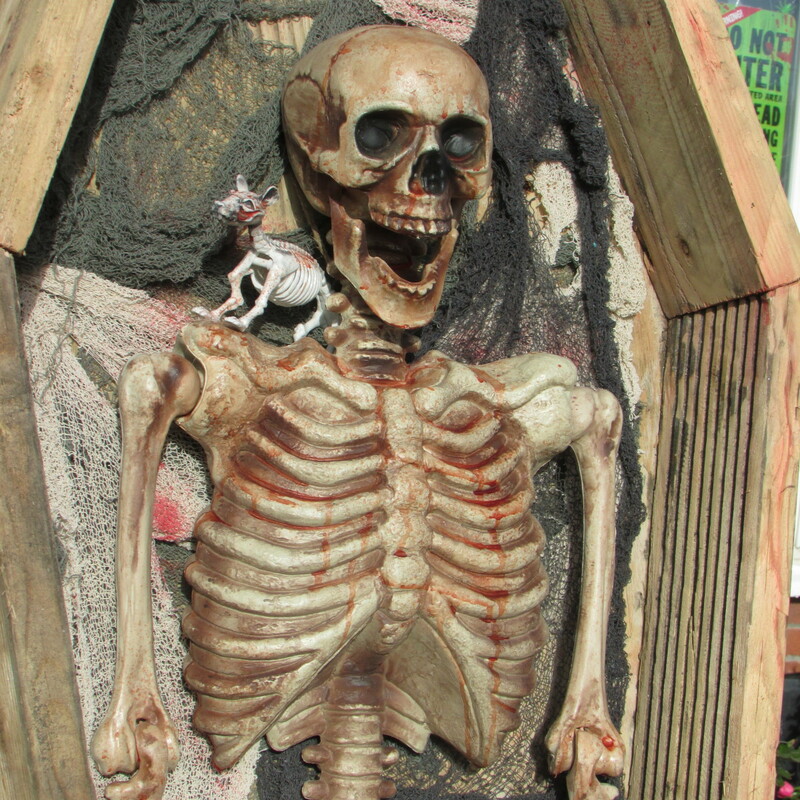 Every year I have been adding to my scary garden display by making a few things from scratch. The kids love it and so do lots of the adults too. I bought everything I needed to make this wreath in charity shops or at car boot sales. The snakes cost me only 10 cents each. I am always on the look out during the year for bits and pieces that can be used for something I make for Halloween. Each year I create something new for my Halloween display in the front yard. This year I have been very busy. Here are the other things that I have made so far. 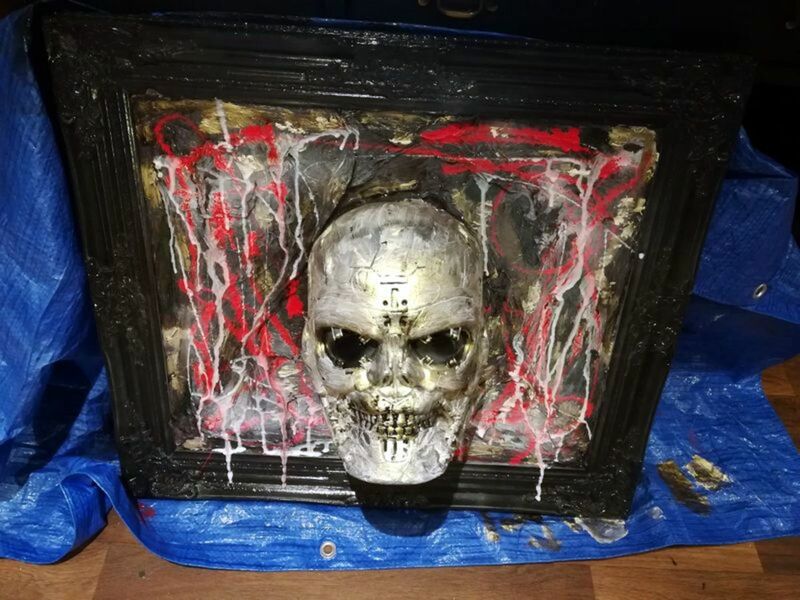 I am very proud at how this blood-soaked skull turned out. I give you a guide so you can have a go yourself. Now to the little boy Georgie and his boat from the horror movie IT. I love this one. 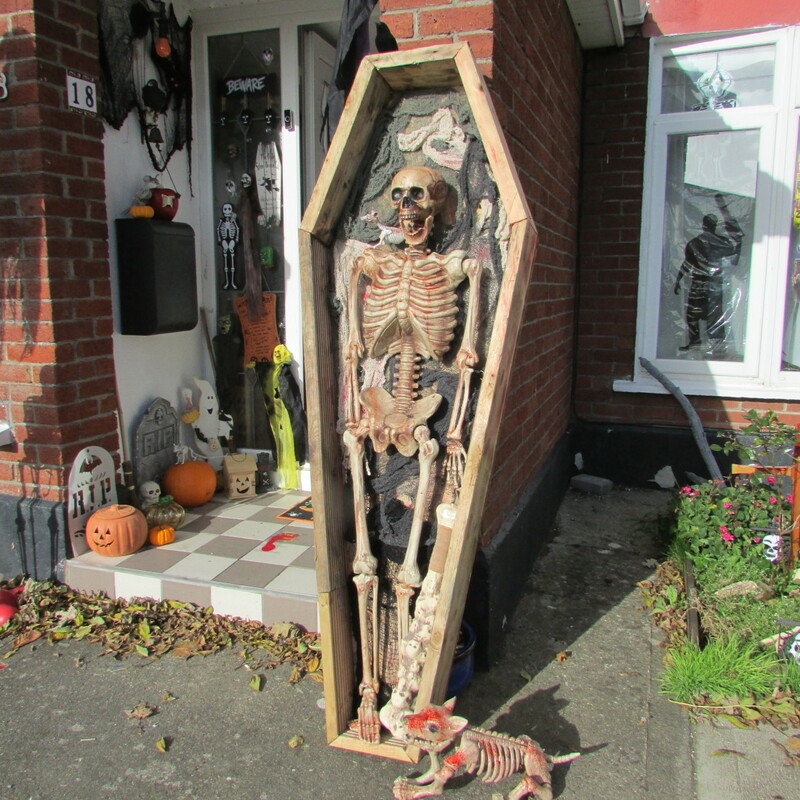 I made this coffin last year and had it displayed in my front yard with my skeleton Percy in it. 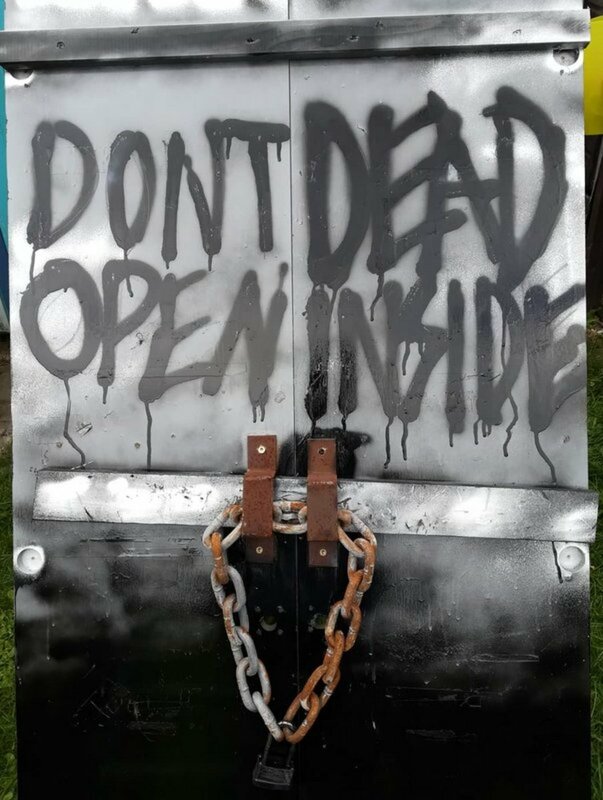 My favorite piece so far is 'The Walking Dead' locked door. The kids loved it when they came trick or treating. They were a little scared but sure that is what this October night is all about. I make lot of the decorations myself and really enjoy doing them. They save me loads of money too because I buy the stuff during the year cheaply. But one thing I did buy new was my skeleton. He takes pride of place in my creepy outdoor display. 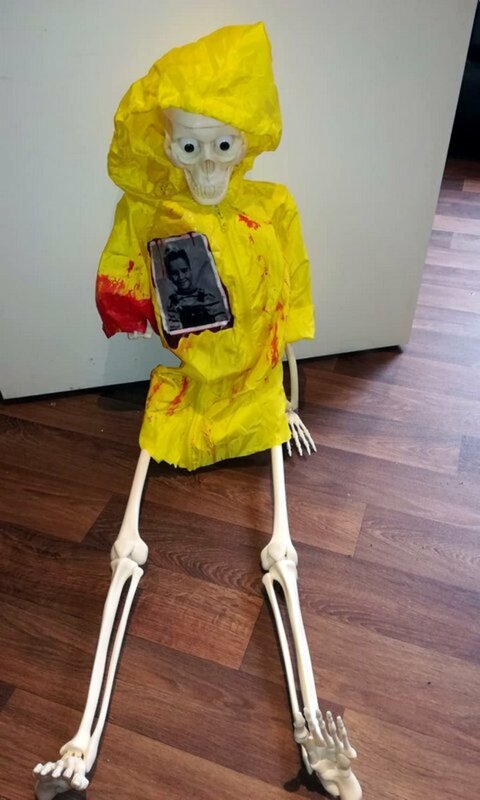 Hello Casangel, Yes it is one of the easiest Halloween decorations I have made so far. I can't wait for the kids to get up close to it when they knock on the door trick or treating. Brilliant wreath , ill try that first the coffin is great but a bit to much for me i think . thank you , i love all your articles .